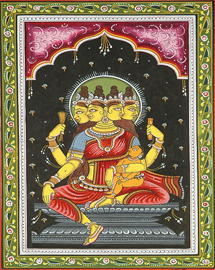 In Hinduism, Saptamatrikas are the seven divine mothers and is often associated with Shiva and Shakti. 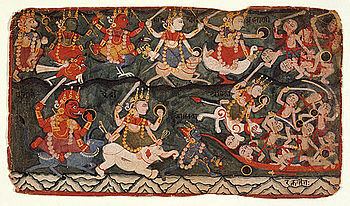 The Saptamatrikas are Brahmani, Vaishnavi, Maheshwari, Kaumari, Varahi, Indrani and Chamundi. Stories about Sapta Matrikas are found in the Varaha Purana, Kurma Purana and the Mahabharata. 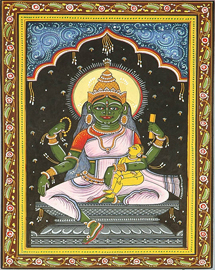 Saptamatrikas are among the numerous incarnations of Goddess Shakti. But their characteristics differ from region to region and from scriptures to scriptures. General belief is that the Saptamatrikas appeared to defeat the thousands of Anadhakas that were born from the blood of demon Andhaka. Andhaka was actually the third son of Shiva. Lord Shiva injured demon Andhaka when he tried to take away Goddess Parvati. Andhaka had received a boon that a single drop of blood spilled from his body will create thousands of Andhakas. So when Shiva injured Andhaka thousands of Andhakas appeared from the blood split. 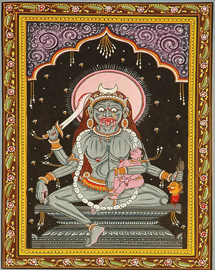 To defeat the Andhakas, Shiva created Yogeshwari and the other gods created Saptamatrikas. The characteristics of the Saptamatris are that of Goddess Durga and Goddess Kali. Some Puranas indicate that the Saptamatrikas are personifications of desire, anger, covetousness, pride, illusion, fault-finding, gossip and envy. And they are worshipped to keep out stay away from such qualities. Saptamatrikas are worshipped individually in temples in India. Some of them are also worshipped during Navratri. Annapoorna Devi is the Hindu Goddess of nourishment. Annapoorna Devi is depicted as holding a golden ladle adorned with many kinds of jewels in her right hand and a vessel full of delicious porridge in her left hand. She is an incarnation of the Hindu Goddess Parvati, wife of Lord Shiva. Annapurna is also referred to as the goddess of fertility and agriculture which calls for immense popularity of this deity in the villages of India. 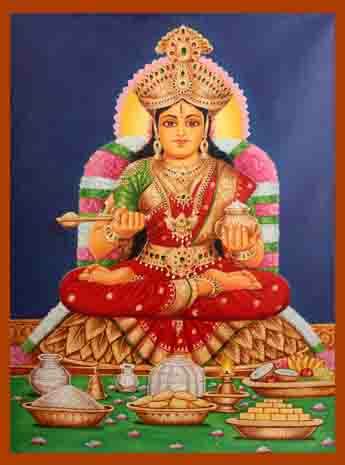 Goddess Annapurna is also reasonably popular in South India with separate shrines dedicated to this deity of food and harvest. 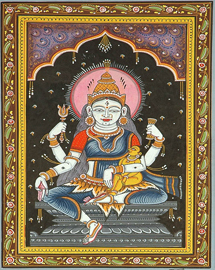 Mahalakshmi is depicted as Devi in her universal form as Shakti. The manifestation of the Devi to kill Mahishasura is formed by the effulgences of all the gods. The Goddess is described as eighteen-armed, bearing a string of beads, battle axe, mace, arrow, thunderbolt, lotus, bow, water pot, cudgel, lance, sword, shield, conch, bell, wine cup, trident, noose and the discus sudarsana. She has a complexion of coral and is seated on a lotus. 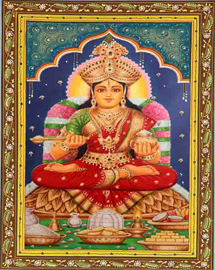 She is known as Ashta Dasa Bhuja Mahalakshmi. Brahmani Vamana Purana indicates that Goddess Brahmani came out from the mouth of Goddess Kali before she engaged Demon Rakta Beeja in the final encounter. Maheshwari Maheshwari is one among the seven mother goddesses or Sapta Matrikas.She is believed to have born from the body of Lord Shiva. 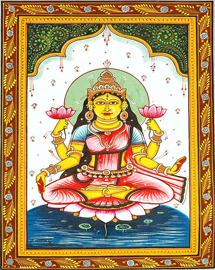 Kaumari Kaumari is the female energy of Lord Kumar (Muruga or Kartik). She symbolically represents valor and courage. Vaishnavi Goddess Vaishnavi had born from the body of Vishnu. 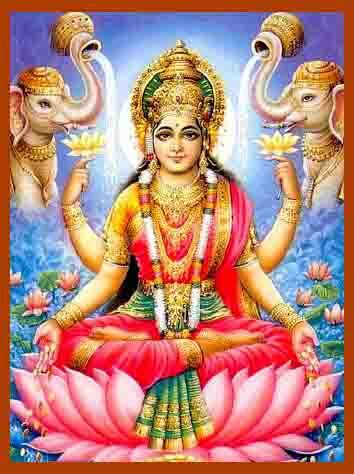 She is armed with the same weapons like Lord Vishnu and wears the same ornaments. 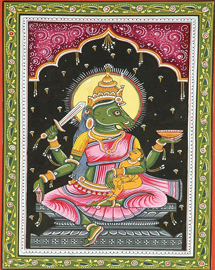 Varahi Varahi takes her name from Varaha – one of the ten incarnations of Vishnu. Scholars and texts are also of the view that she is Lord Yama’s energy. Indirani Indrani has similar characteristics of Lord Indra. A puja dedicated to Goddess Indrani is performed during the Ashada Navratri. Chamundi Goddess Chamundi Devi is one of the most popular forms of Goddess Durga. 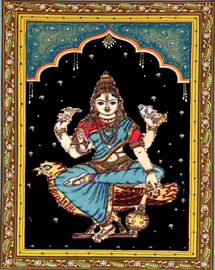 The origin of Goddess Chamundi is mentioned in the Devi Mahatmya and Markandeya Purana. 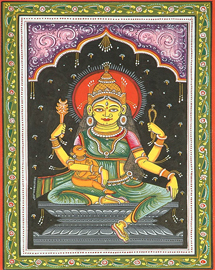 Mahalakshmi Mahalakshmi is depicted as Devi in her universal form as Shakti. The manifestation of the Devi to kill Mahishasura is formed by the effulgences of all the gods. Annapoorna The Devi Annapoorna is the goddess of food and harvest and is believed to be the one who fills the stomachs of the hungry with her noble powers. Copyright © 2012-13 www.Omkareshwara.com All Rights Reserved.